Just a few days old and I've made some major revisions, so even if you've read it, breeze through it again. And again, further revisions (Sep 9). Once you spotlight a long-forgotten topic, new info is frequently brought to your attention in the days that follow. Another new pic added Oct 2. And...still further photos and information added Nov 16. Fun new info added Dec 10 and even more good stuff on March 27, 2018. 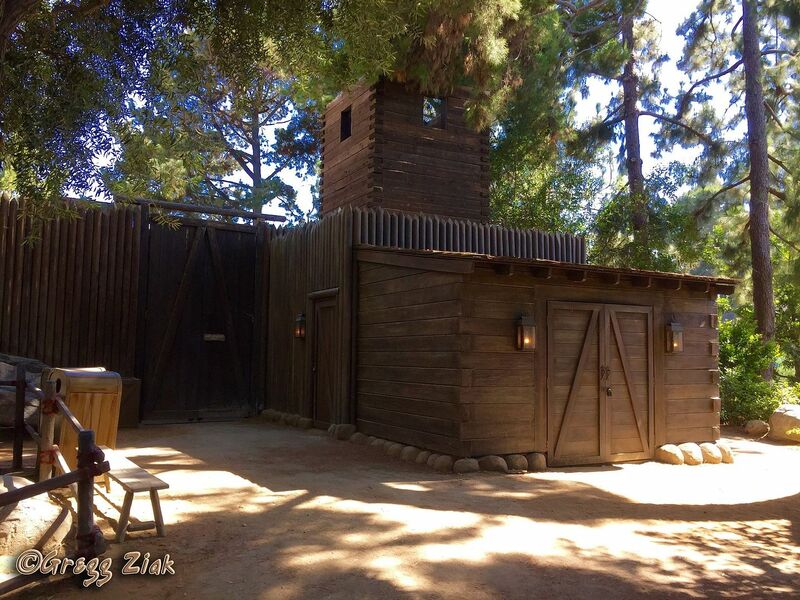 I've vacillated a long time about doing this post, because it's not really Mansion-related. On the other hand, I'm pretty sure that the topic will be of special interest to Forgottenistas. Also, it's a topic no one else seems to have covered, which appeals to my twisted sense of pity. By rights it should be given a mini-blog of its own, but I've decided to put it here where it's more likely to be found by an appreciative audience. If you put "Excursus" on something, you're pretty much bullet-proof anyway. 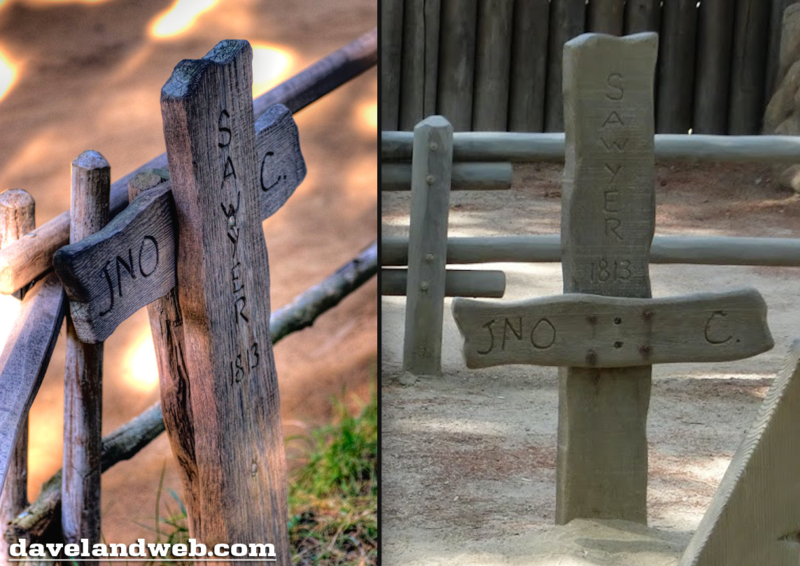 I'm talking about the Tom Sawyer Island graveyards, of which there have been three. One of them just recently disappeared, another disappeared decades ago, and the third was barely there, lasting only from 1956 to 1957. Most of you probably know about the first one, a lot of you probably know about the second. But the third? Not so much. So stick around and maybe learn something. 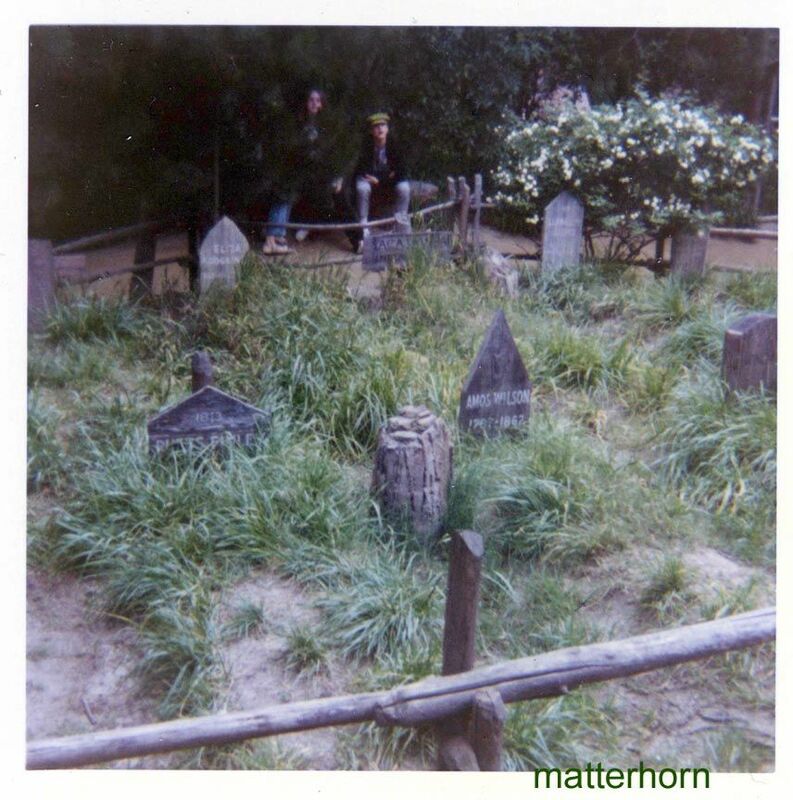 These burial grounds were the immediate precursors to the Haunted Mansion's outdoor graveyards, and remember too, that the Mansion was at one time considered part of Frontierland, so I suppose those considerations give us further flimsy pretext for taking up the topic here at LF. 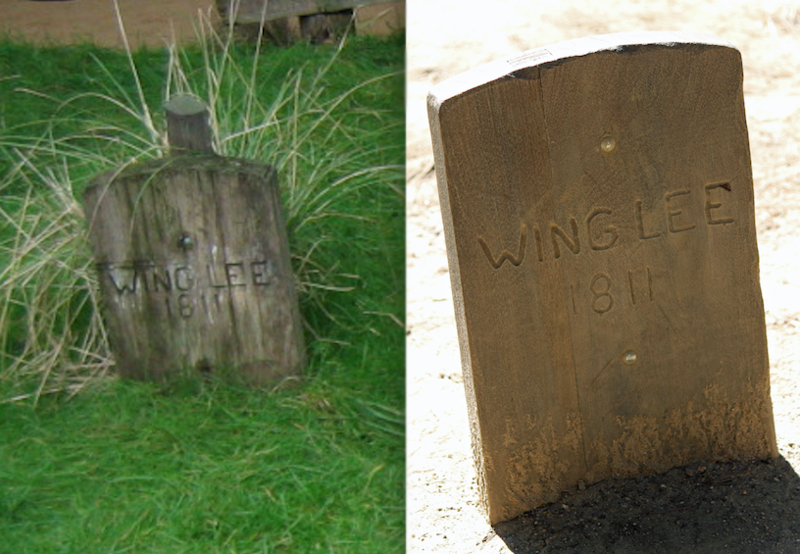 Since it's possible that the little cemetery may yet return in some form, I'm not going to go nuclear over this. It's a wait-and-see situation. 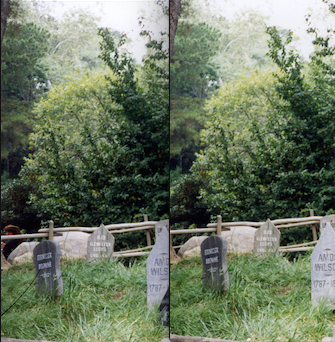 Nowadays, it's even deader back there, I imagine, than when the imaginary dead were back there. 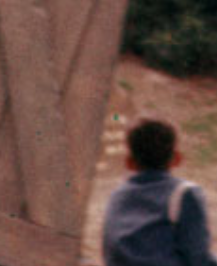 at least by 1957. 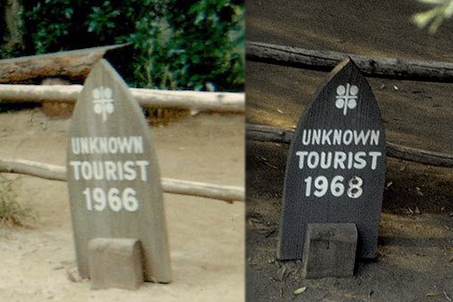 You can see it on the 1957 souvenir map and in 1957 photos. 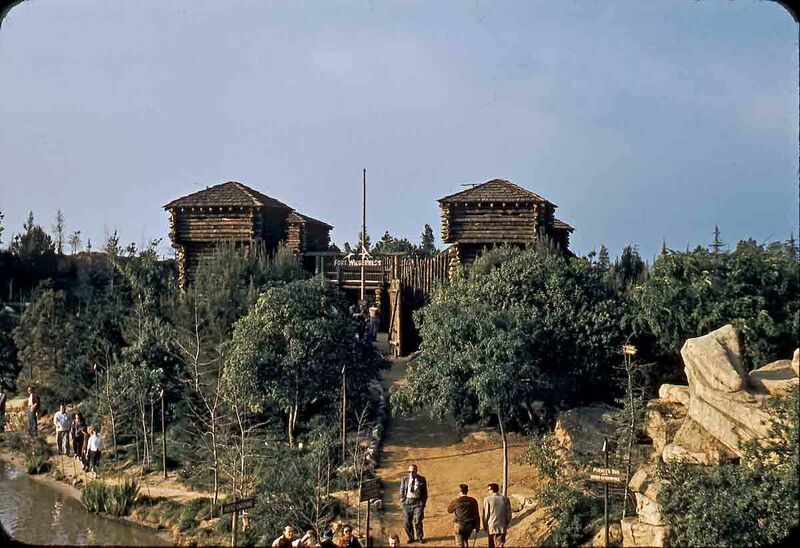 there when the island opened, but this 1956 photo proves that it was not there yet. 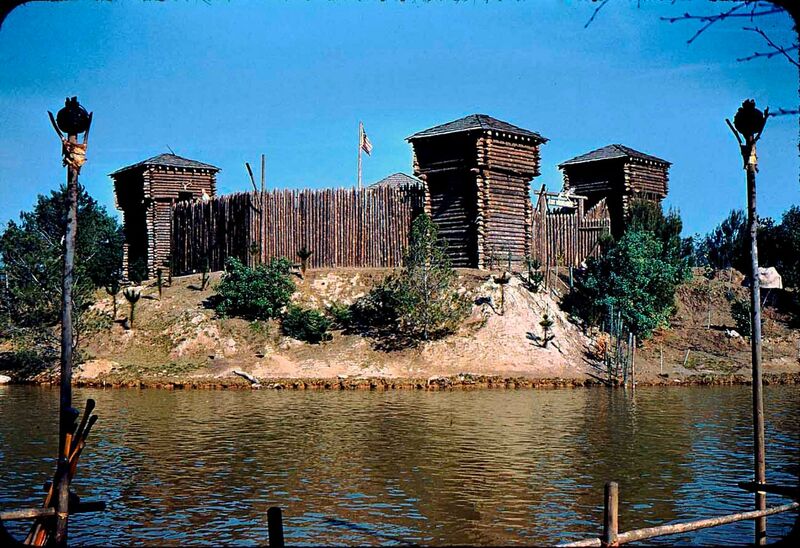 It seems that originally, you could go into the fort, but not around it or out the back of it. 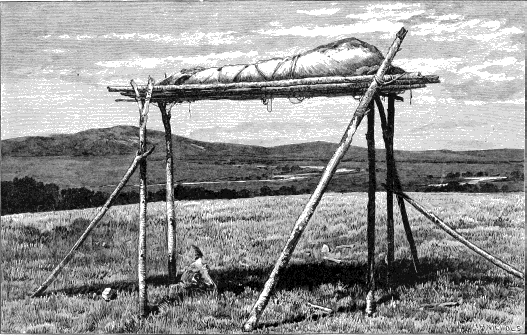 There were sometimes as few as ten but usually eleven or twelve graves. 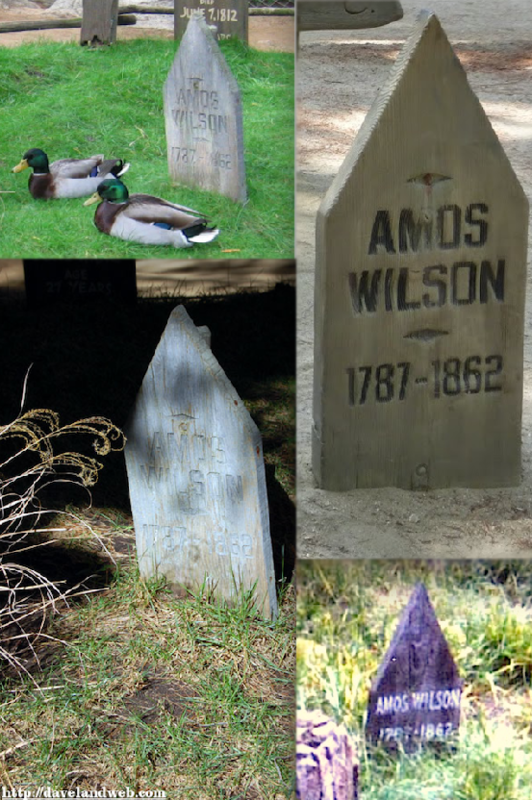 However, there were at least seventeen different headstone varieties over the course of its existence. 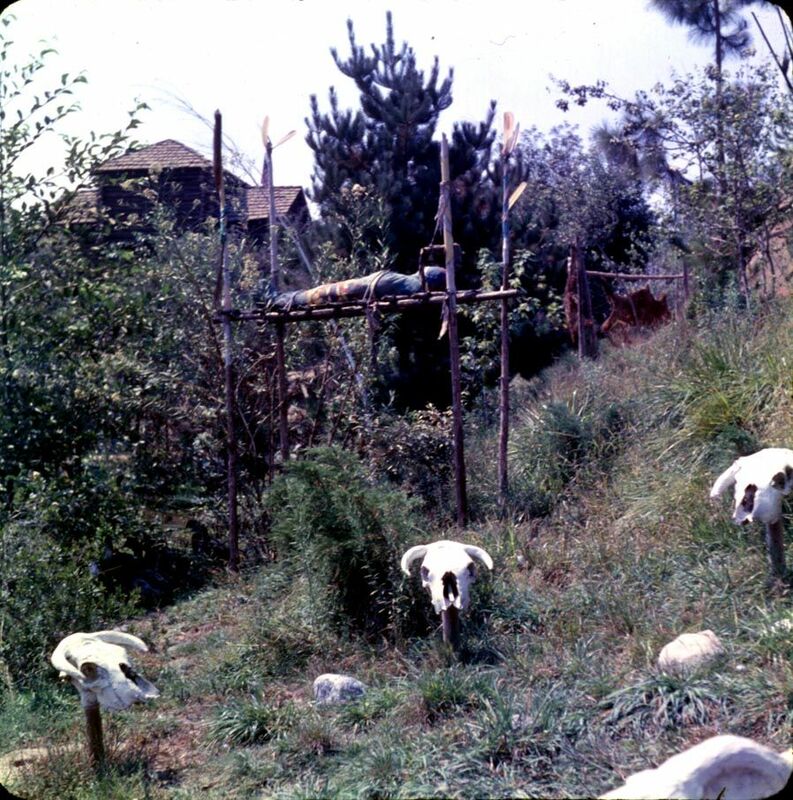 Although a few of them did shift around a bit (kinda like the HM berm graveyard that way), the majority remained in their original locations. The one exception to this took place during a rehab that probably took place in the very early 80s (but possibly as late as the early 90s), when they were put back all higgledy-piggledy, and they stayed that way until the late 90s, when an authority with more respect for tradition evidently took notice of this outrage and restored them to their original positions. 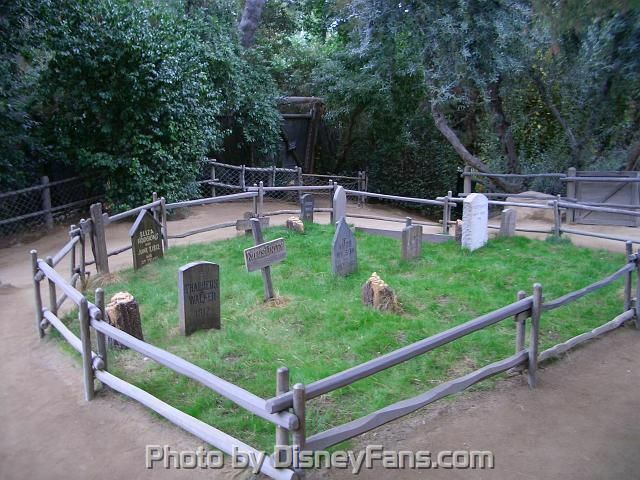 The most radical permanent change took place in 2009, when the whole graveyard was spun around 180 degrees. 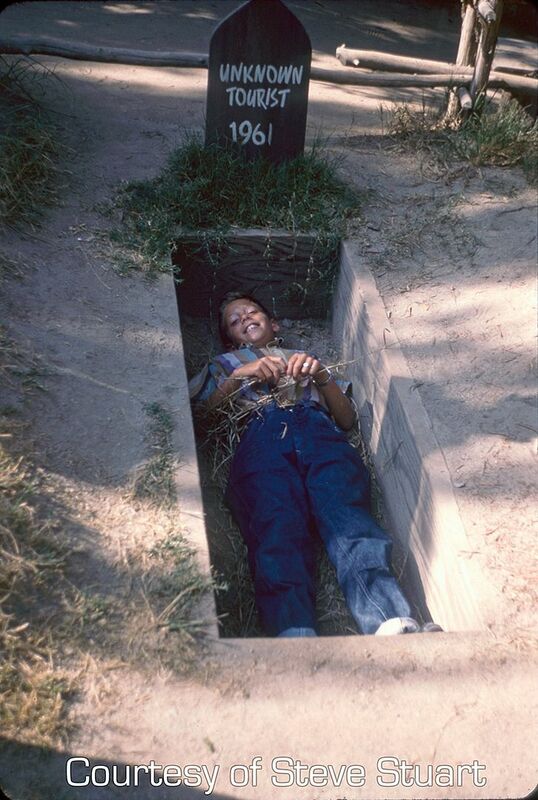 The layout of the graves was mostly preserved in the front row but mostly scrambled in the back. were redesigned, the Tokyo versions invariably followed the old form, so sometimes photos of theirs are helpful for comparison. Okay, let's get to the detailed review. Because this information has to be somewhere on the Internet, doesn't it? These first nine are they which were there from the beginning and stayed to the very end. It's tempting to call them the other, other "Nine Old Men," but some of them were women. 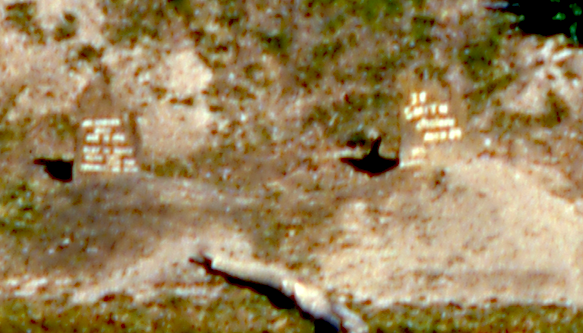 (The 1958 shot above shows that originally Amos had a "roof." "W Pierre Feignoux, J'y Suis J'y Reste, 1809"
"Eliza Hodgkins, Died June 7, 1812, Age 27 Years"
This tenth one was probably there at the beginning but didn't make it to the end. 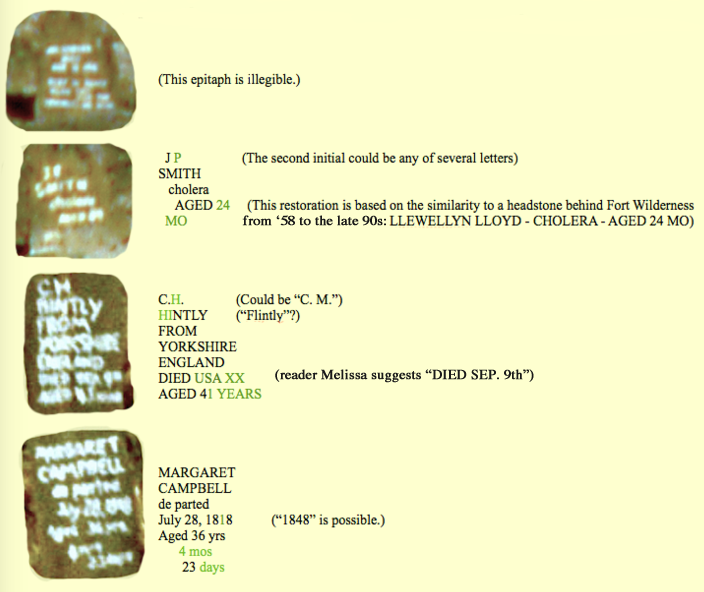 "1813, Llewellyn Lloyd, Cholera, Aged 24 Mo"
Lloyd disappeared sometime in the late 90s. 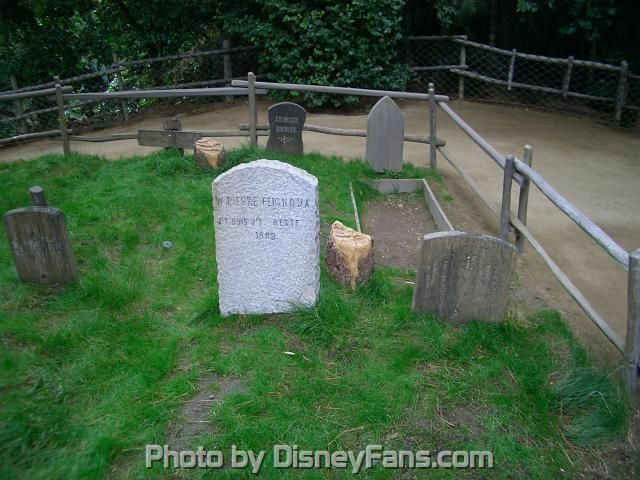 Maybe the epitaph was deemed just a little too sad for Disneyland. and it stayed to the bitter end. It started in the front row towards the left but moved to the back and took Lloyd's place when it was removed. 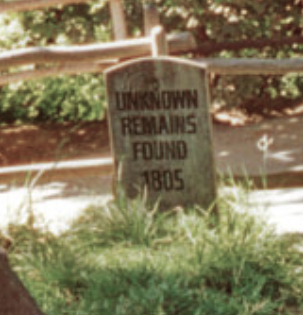 "Unknown Remains, Found July 24, 1812"
And that one in turn was replaced with "Unknown Hostile, 1842, HM..ID." Reader Craig Conley points out that "HM" is the standard Latin abbreviation for hoc monumentum ("this monument"). His further suggestion that "ID" may mean idibus ("on the ides") is less convincing. I suspect it's simply idem (also abbreviated "ID"), a term commonly used in bibliographical notation with the meaning "the same [author as previously cited]," in order to avoid tedious repetition in multiple consecutive citations from the same author. But that's a technical usage. The word idem by itself simply means "same" or "identification." Thus, "HM..ID" could be an abbreviation for hoc monumentum ... idem, in this context meaning "this monument serves as (sole) identification," which makes admirable sense. 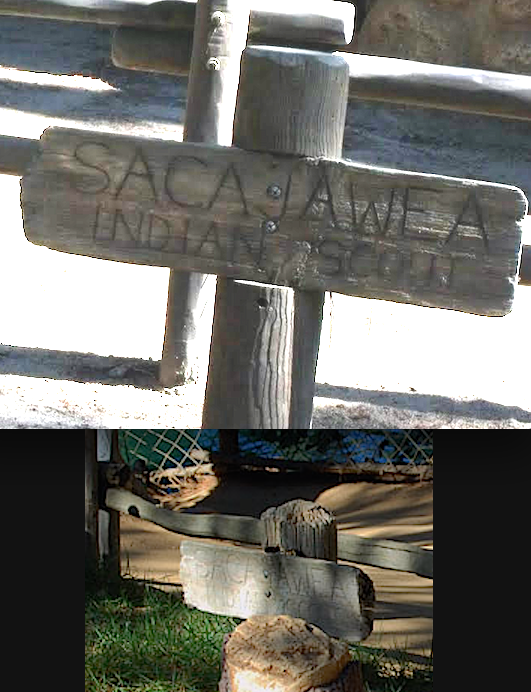 In all three forms that grave marker was found toward the center of the back row, the first version to the right of Sacajawea, the second and third versions to her left (the viewer's right, the viewer's left). 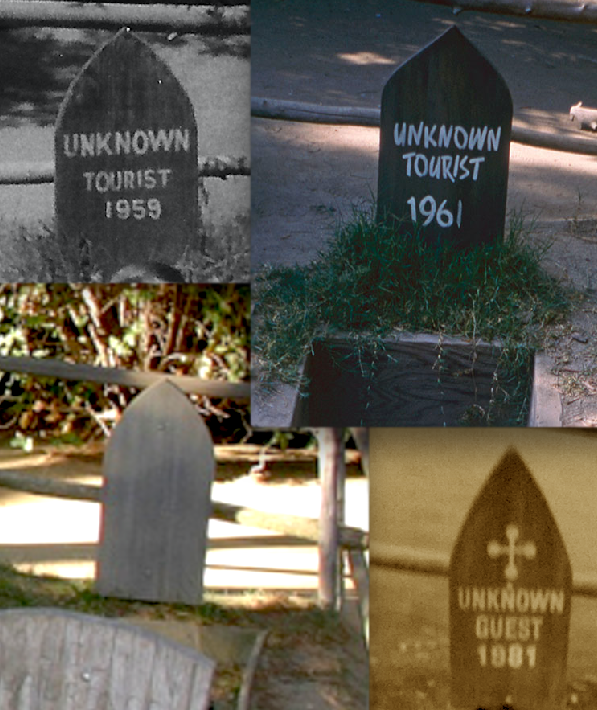 The second "unknown" variety was an open grave obviously there as a comic photo op: It was marked "Unknown Tourist" (later "Unknown Guest") followed by the current year, so it had to be updated annually. 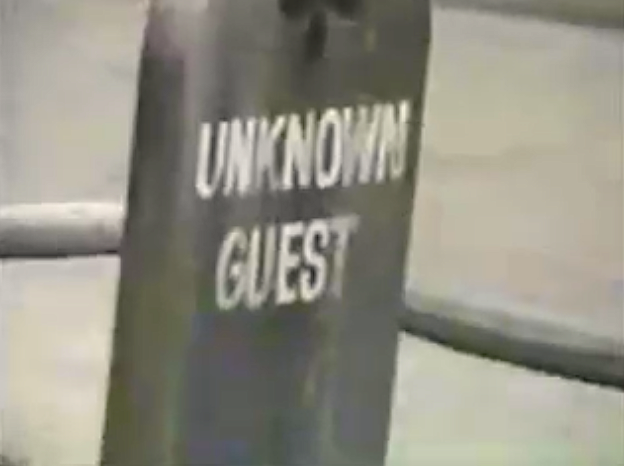 By the 90s it was just "Unknown Guest" without any date, and finally it was just left blank. 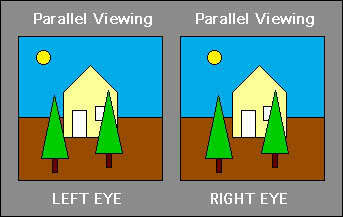 It was probably there from the beginning and always found at the far right of the back row. 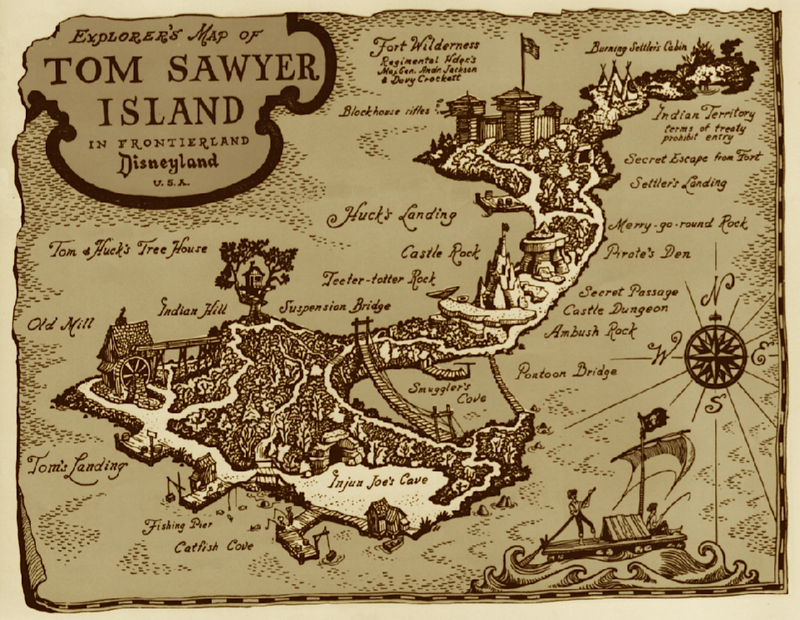 It disappeared in 1981 or early 82 and returned when the "higgledy-piggledy" rehab was undone and the traditional layout was restored. It didn't survive the 2009 spin-around. photo-op empty grave disappeared in 1981 and was replaced by the "Unknown Remains, Found 1805" grave. 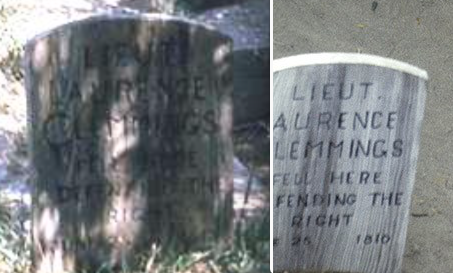 In the original post I wrote this: "Two of the headstones reflect real history in some form, while the rest are simply made up names, without any significance. 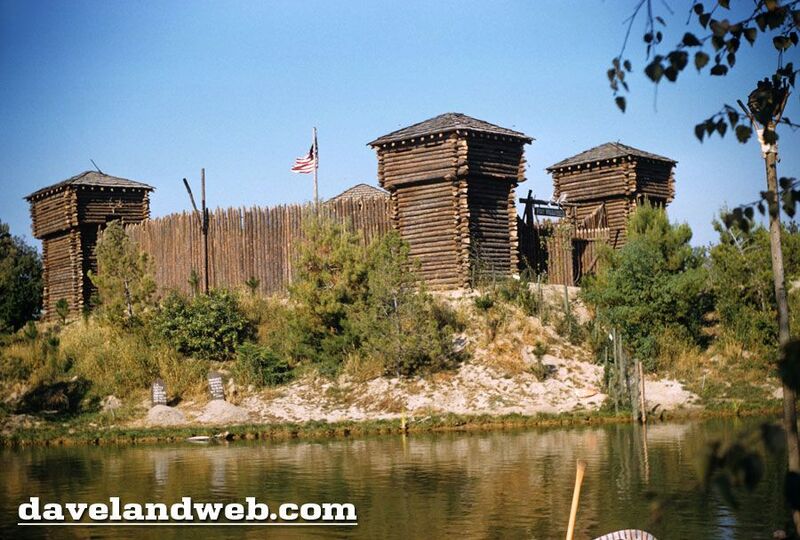 At least I haven't been able to find any correspondents in history or among Disney employees. Sorry to disappoint. 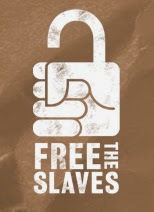 Don't you know I wish I had quaint background stories to tell about Amos Wilson and Thaddeus Walker, et al, but it seems to be the case that these dead men really do tell no tales." 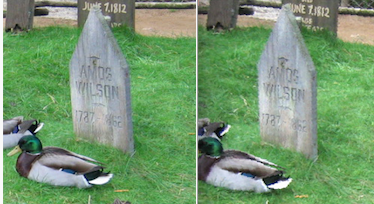 "Amos Wilson was my Great Grandfather. He was a WW1 vet from Oklahoma. He worked in the shipyards during WW2. He was also an artist. 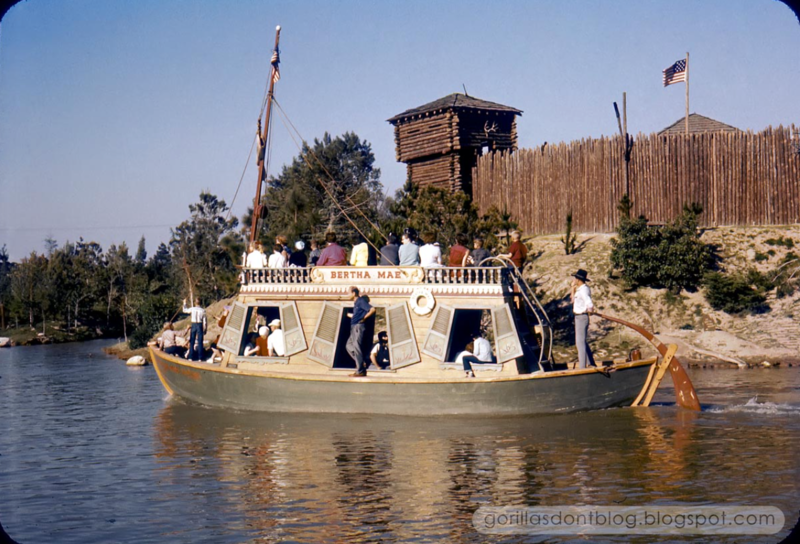 He did all of the detailed painting on Walt Disney's yacht, and when Disneyland was built Walt remembered him and hired him to do the original painting on the Columbia. 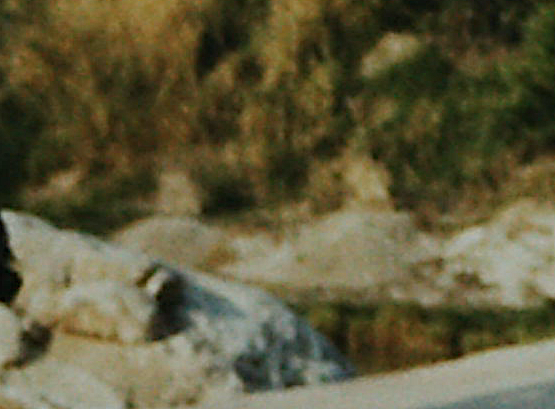 He also painted the original tea cups and the Carlsbad Caverns [sic. I'm sure he means Rainbow Caverns]. 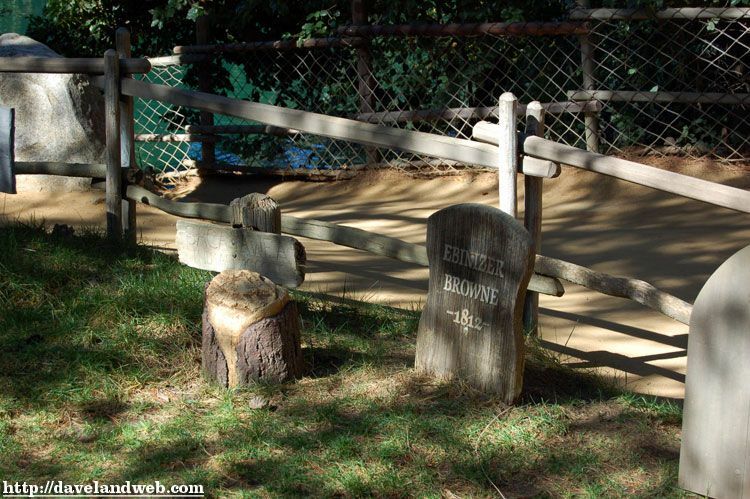 If Walt Disney liked you he named something in the park after you. 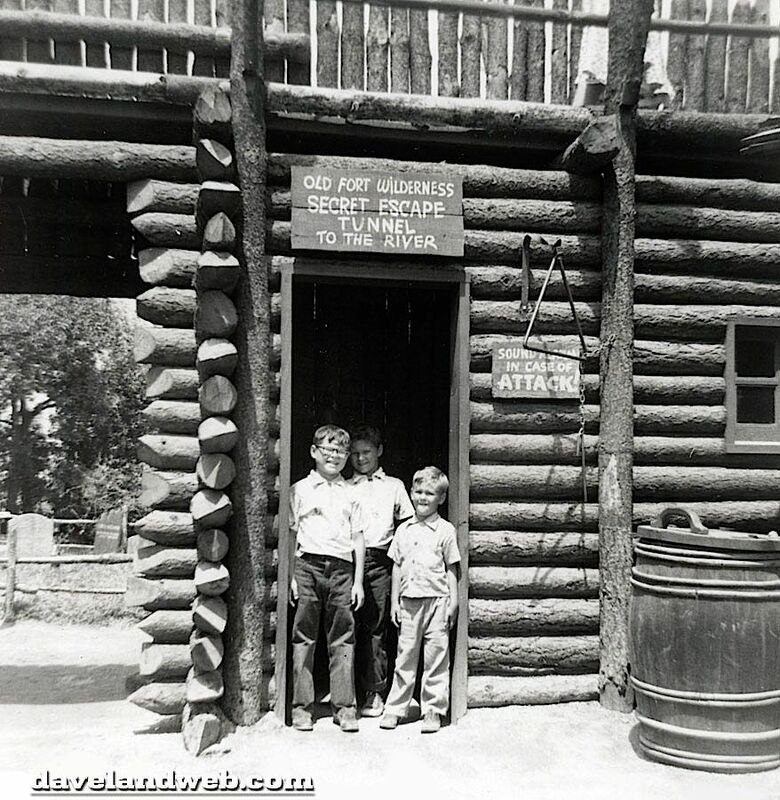 It has always been a neat thing for my family. 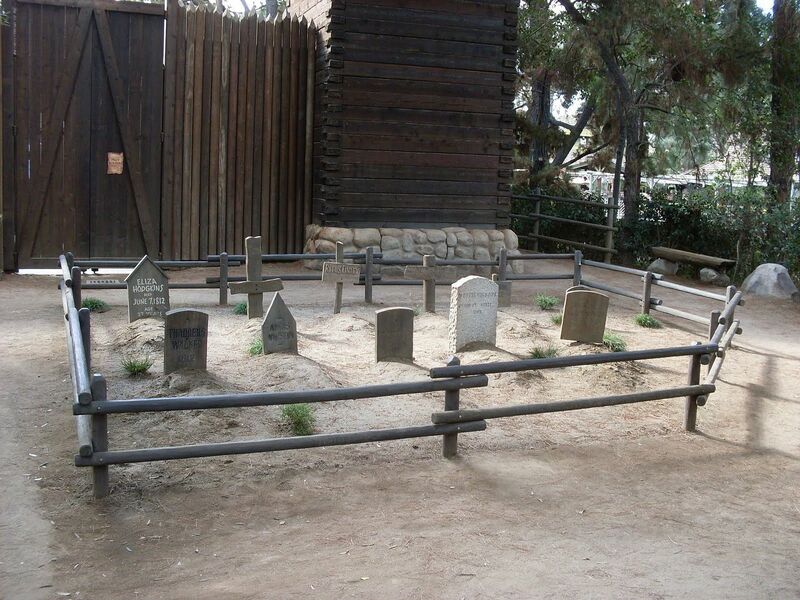 Hope they bring the cemetery back somewhere. 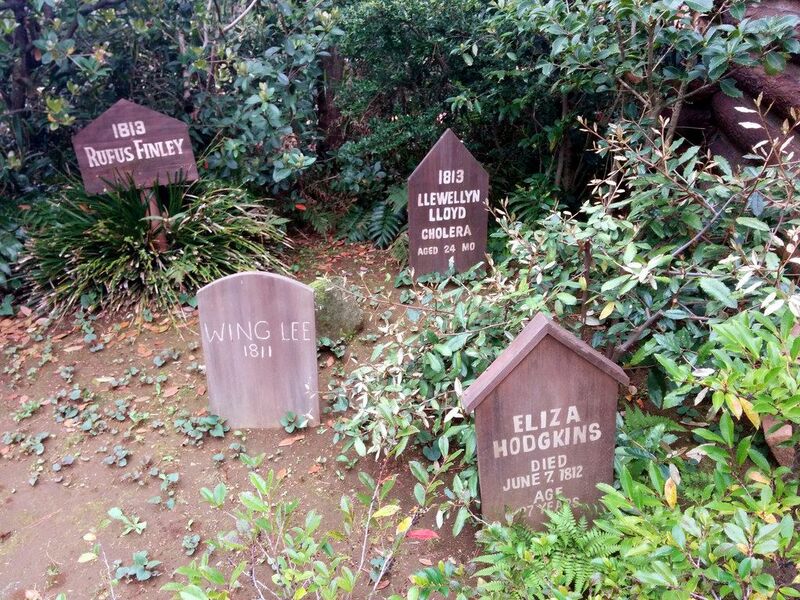 There is a lot of history at Disneyland." 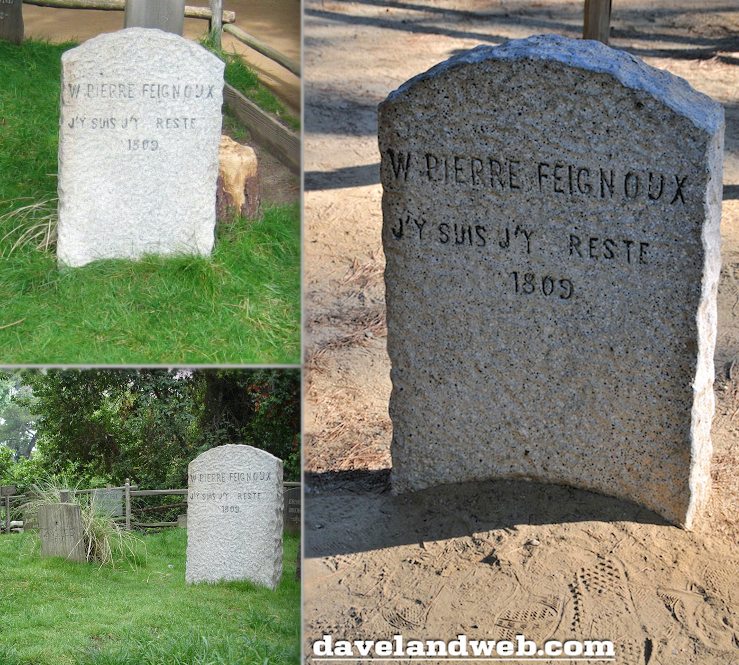 Besides Amos, the two headstones reflecting actual history are "Sacajawea, Indian Scout" and "W Pierre Feignoux, J'y Suis J'y Reste, 1809." 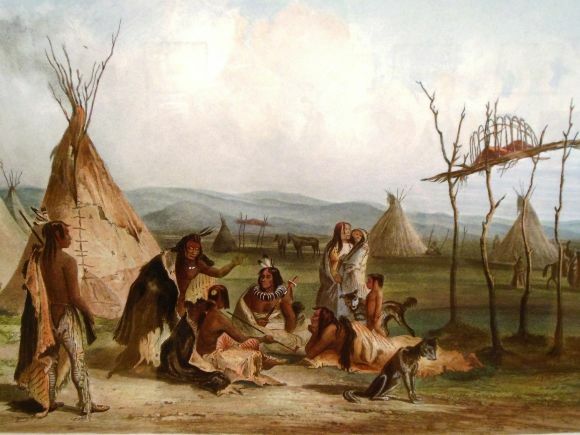 I'm sure many of you already know that Sacajawea was the guide for Lewis and Clark during their 1804-1806 "Corps of Discovery" expedition into the American west. 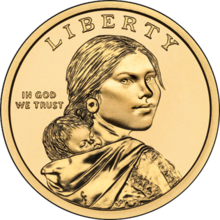 Her profile got a significant boost in 2000 when she showed up on new $1 coins (that no one wanted; our wise and benevolent government keeps trying to force the public to use dollar coins, and the public keeps saying No). As for "W Pierre Feignoux, J'y Suis J'y Reste, 1809," the date is wrong and the name is meaningless, but the slogan is historical. If we want to properly catch the resolute and defiant tone, we should perhaps translate J'y suis, j'y reste along these lines: "That's where I am, dammit, and that's where I'm staying." 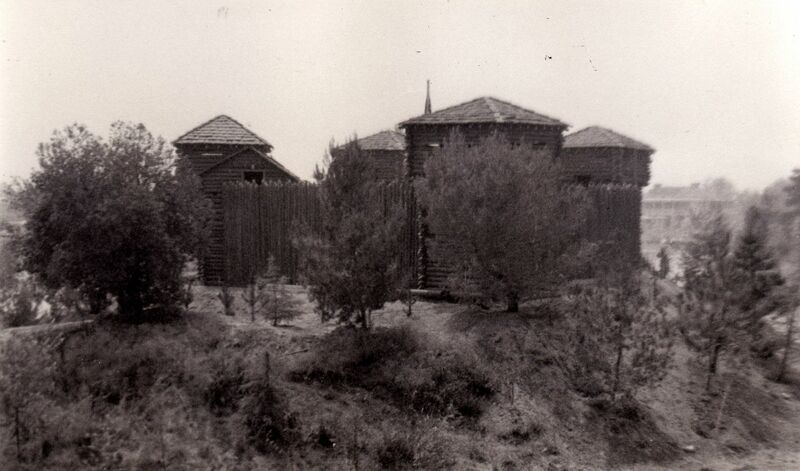 It originated during the Crimean War, during the siege of Sevastopol in 1854-55. A French general of Irish descent named Marie Edme Patrice MacMahon had successfully captured a Russian fortification on a strategic hill but was told by another general to abandon it, since they suspected the Russians had undermined it and were planning to blow it up. MacMahon haughtily replied "J'y suis, j'y reste" and refused to budge. 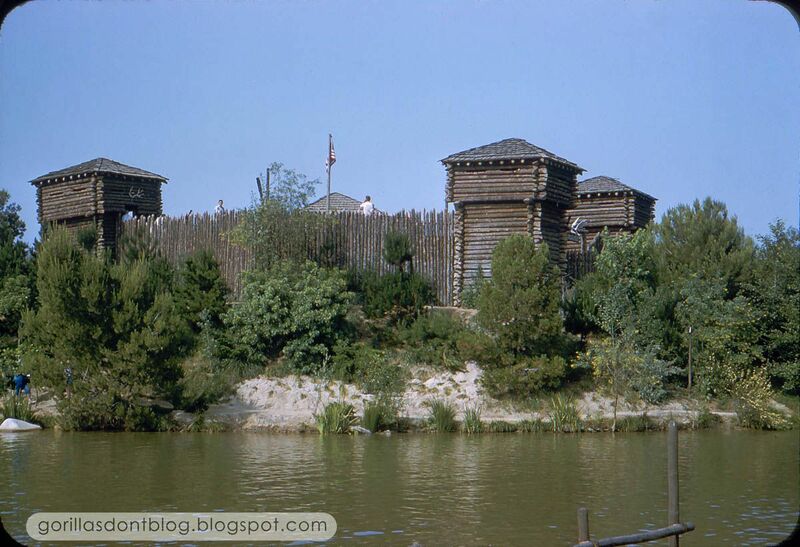 There was indeed an explosion, but it caused little damage to the French forces, and the siege ended soon afterwards when the Russians withdrew. Thus was born a French catch-phrase for heroic stubbornness. 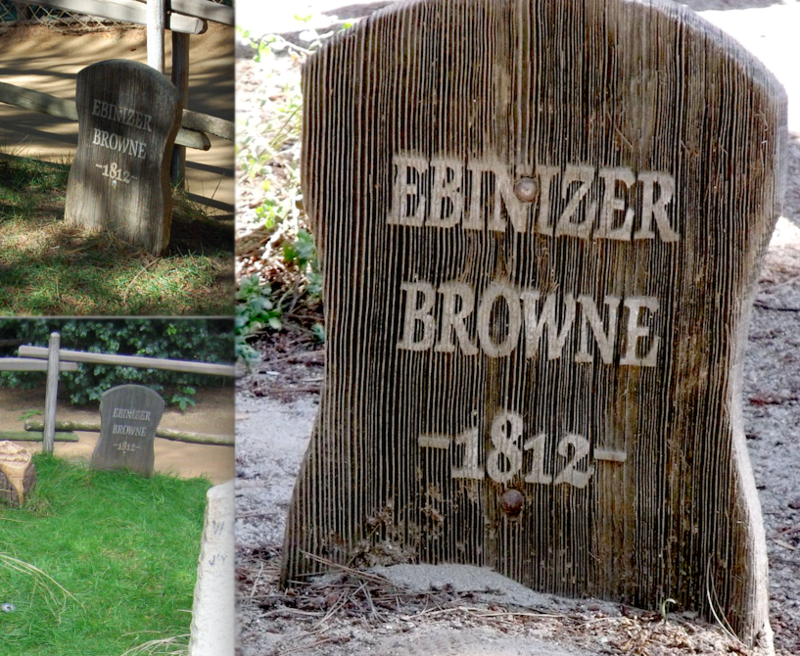 Until recent days, the slogan spoke well enough for the headstone itself, since it did indeed stay right where it was planted for a very long time. That's where it was, and that's what it said. 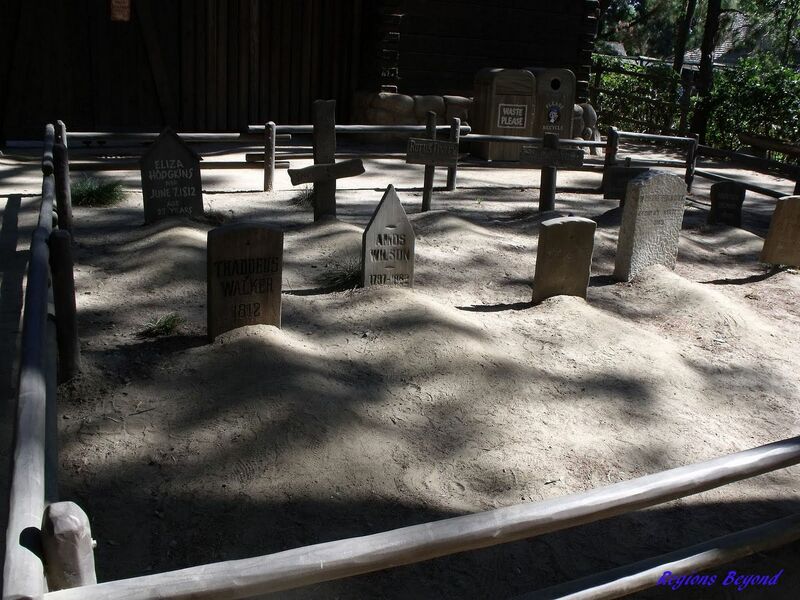 I'm not sure there is any need to look for an immediate inspiration for the Fort Wilderness cemetery, but if there was one, I'd say the "Boot Hill" graveyard at Knott's Berry Farm is as good a candidate as any. 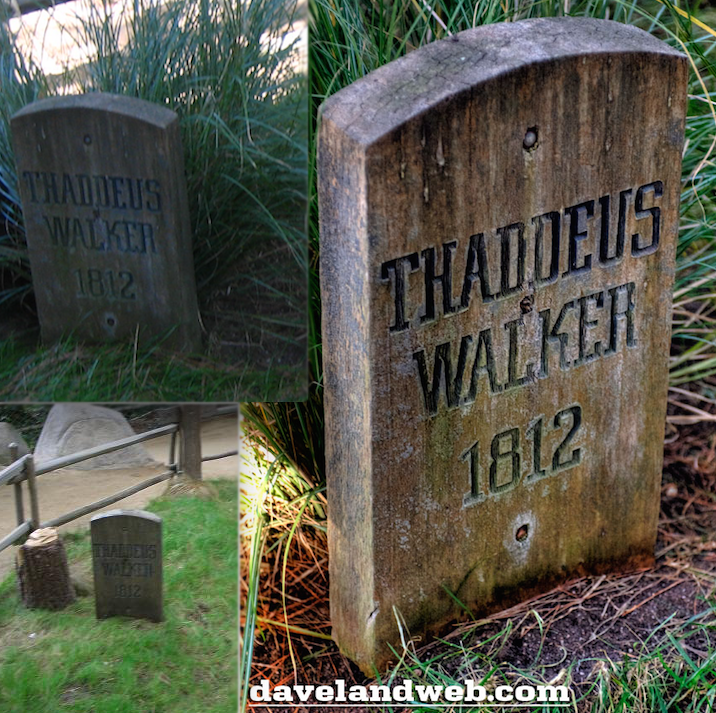 What's funny is that those are funny, whereas the Fort Wilderness graves are utterly grave. 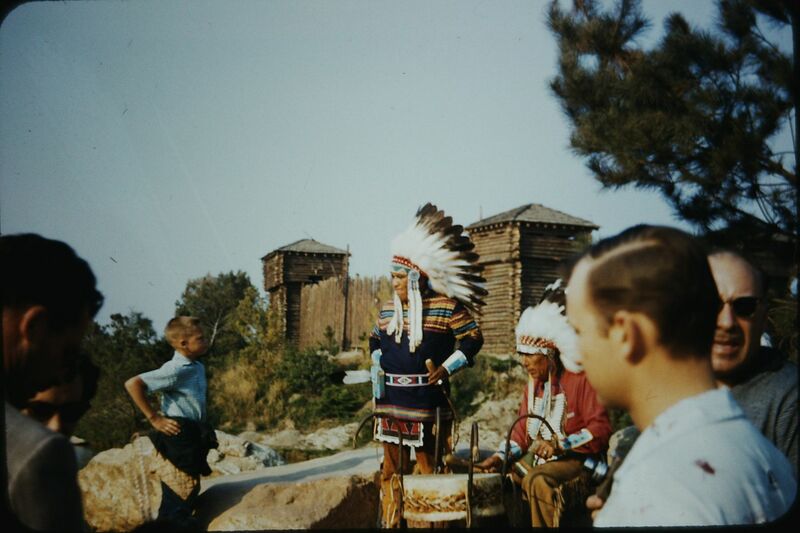 I suppose one could argue that the serious tone is due to the fact that 1956 Disneyland tended to present the Frontier experience with a straight face ("hard facts" and all that), but then there's that gag grave, breaking the fourth wall by referring to Disneyland's "tourists" and "guests" and put there strictly for yuks. 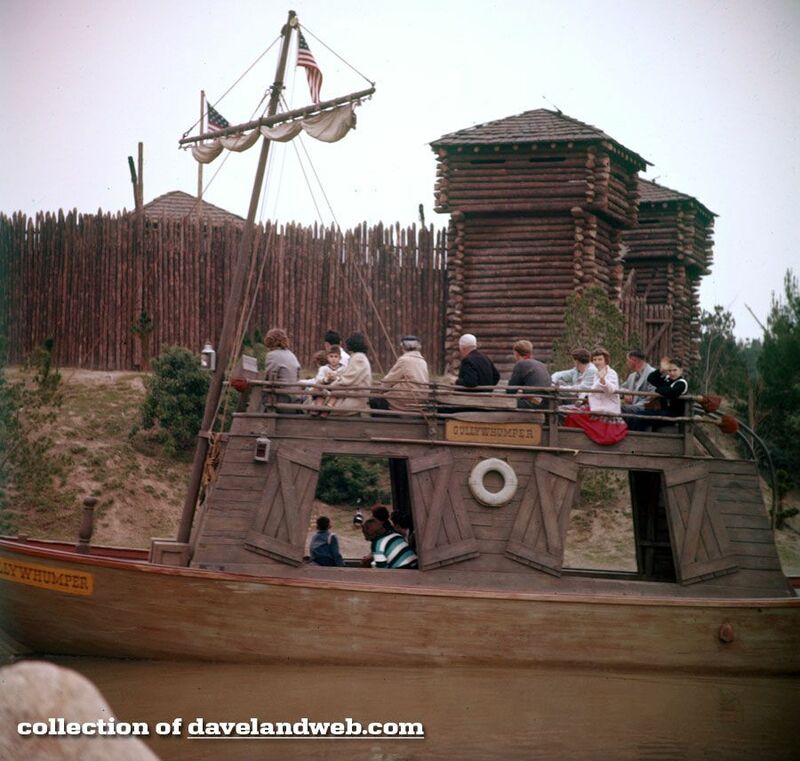 At any rate, the quintessentially Mansionistic joke about you the visitor joining the resident revenants was already foreshadowed on Tom Sawyer Island in the fifties. 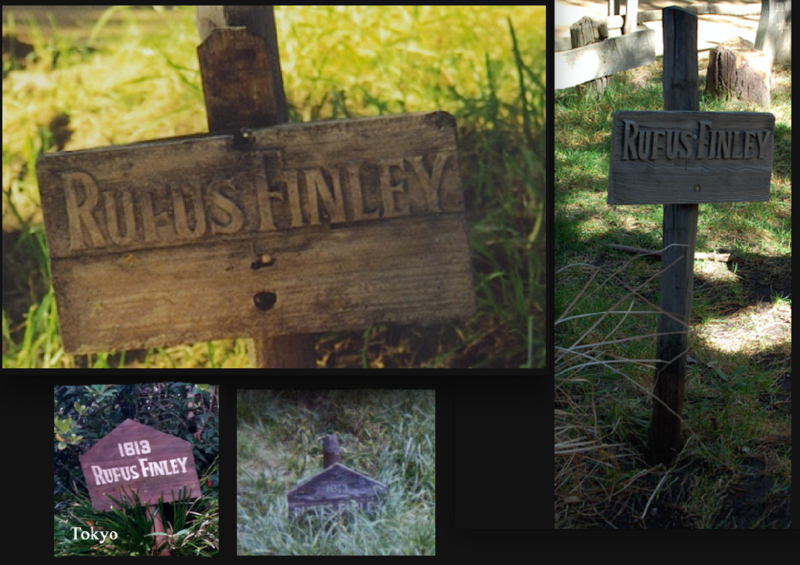 Before we move on, there's one more quirky and irresistible detail about the FW graveyard that I cannot pass by in silence. 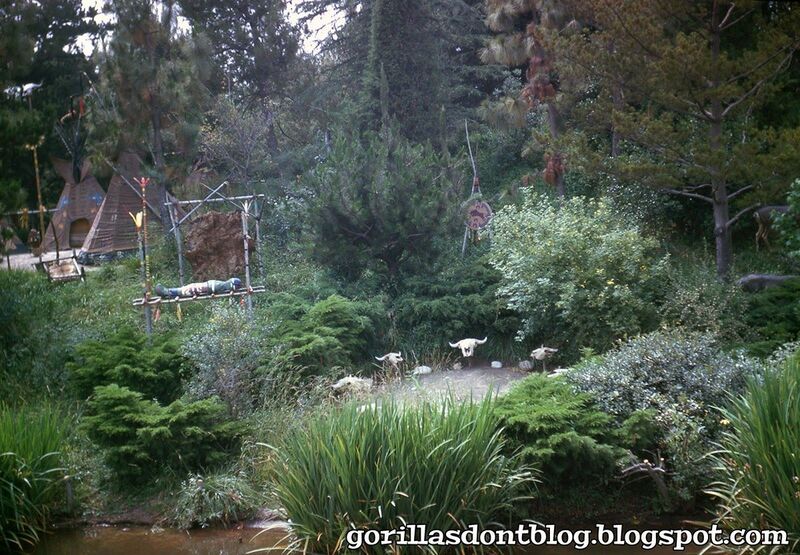 Before the 2009 flip, there were four fiberglass tree stumps in there. 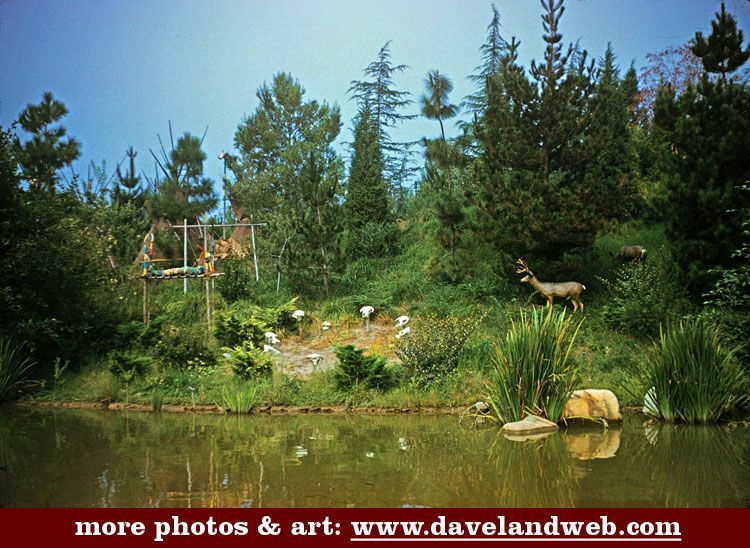 They were so realistic and so exquisitely done that they were . . . oddly beautiful things. 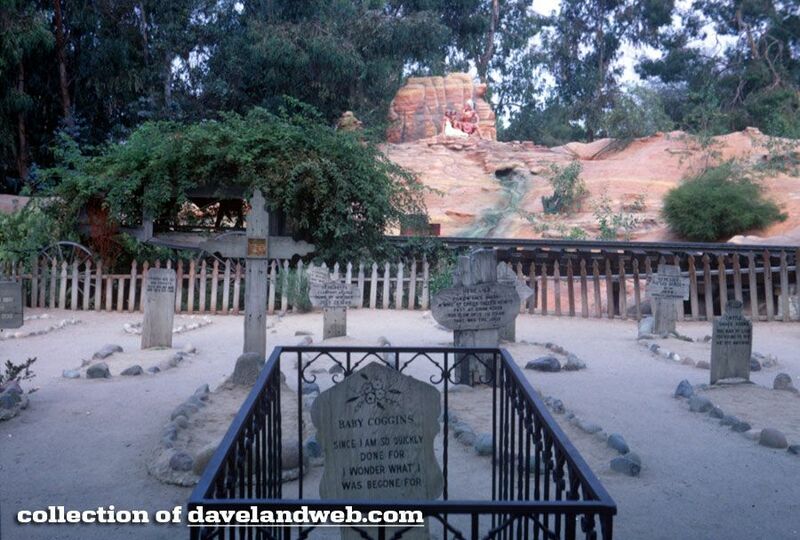 Yeah, I've already used this 2003 Allen Huffmann shot, but it gets my vote as the single best photo of the FW graveyard, so here it is again, and here it remains.. Someone in the model shop went to a lot of bother for those. Why? 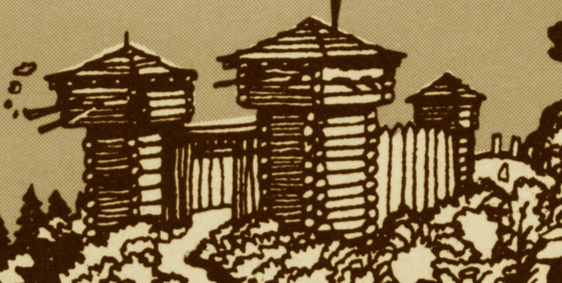 Well, if you look closely, you'll see that they are in circumference about the size of the logs that make up the Fort itself. 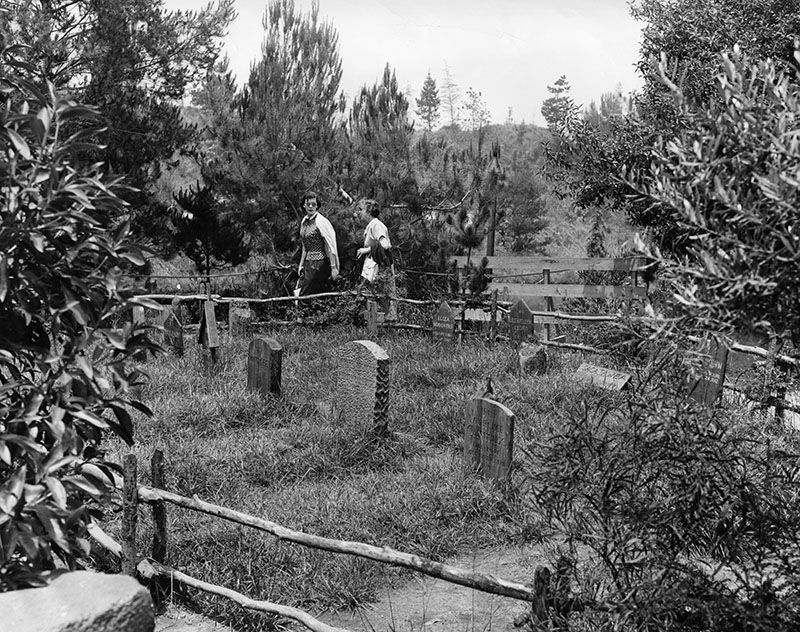 You're supposed to think of this graveyard as something the settlers put into a clearing in the forest created by the cutting of timbers to build the Fort. I don't suppose that's too terribly important, but you hadn't thought of it, had you? 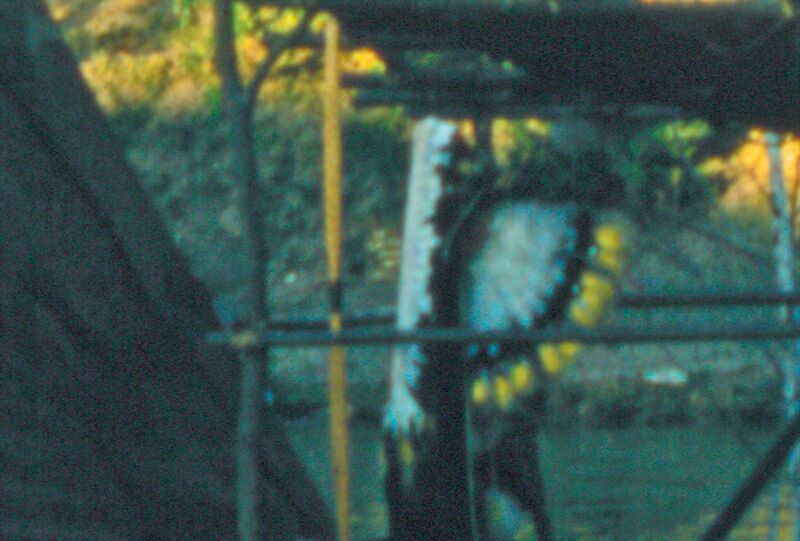 And now that you have, it inspires your imagination to tell you a tale of how this thing came to be, does it not? And Disney does this sort of silent storytelling better than just about anyone, do they not? And pompous rhetorical questioning gets wearisome after awhile, does it not? 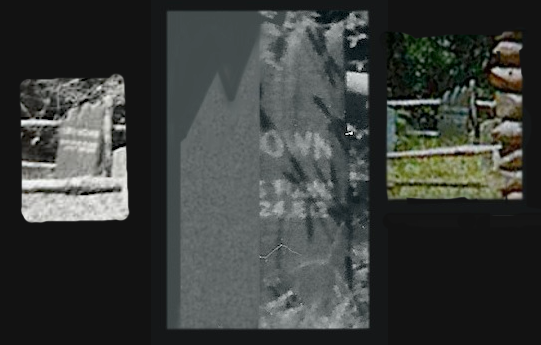 Let's move on to gravesite number two, shall we? Plenty of you remember this one as well, since it only disappeared in the 1990s after being a fixture on TSI since it opened in 1956. 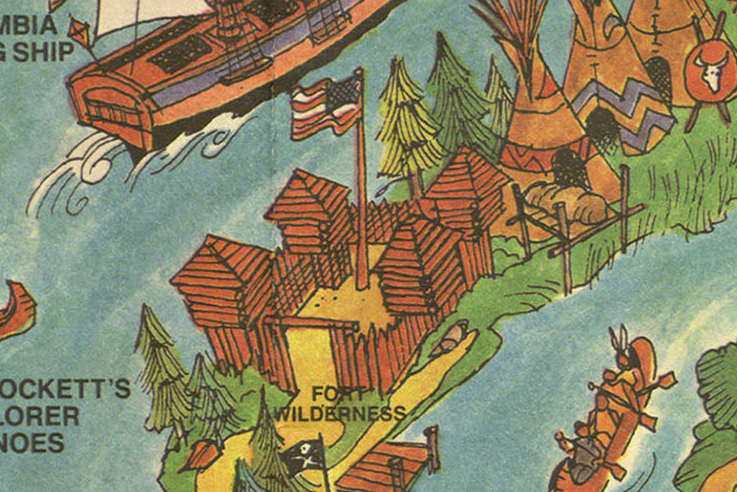 It was conspicuous enough to warrant inclusion on the park's McKim-inspired souvenir maps, beginning in 1966. Dave and the Major have impressive collections of photos, facilitating a "through-the-years" survey of this elevated subject. Notice how surprisingly much the sombre and yet colorful scene was altered during its long and silent career on the shoreline. 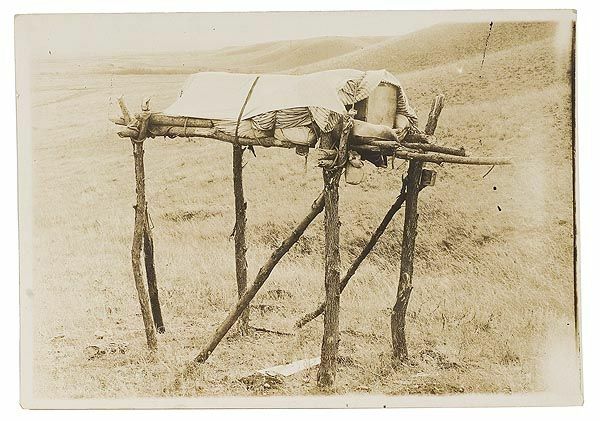 Just this morning (Oct 2, 2017), the Major put up a photo from 1956 showing the Lakota-type burial. 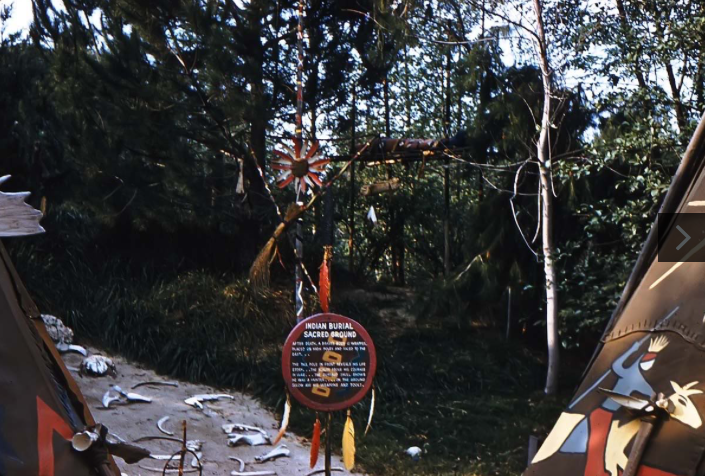 The assumption originally was that this was a photo of the Indian Village scene on the west side of the river, but a close examination of the foliage and show pieces in comparison with the 1958 photo below convinces me that this is indeed Tom Sawyer Island and is our earliest photo yet of the tableau there. 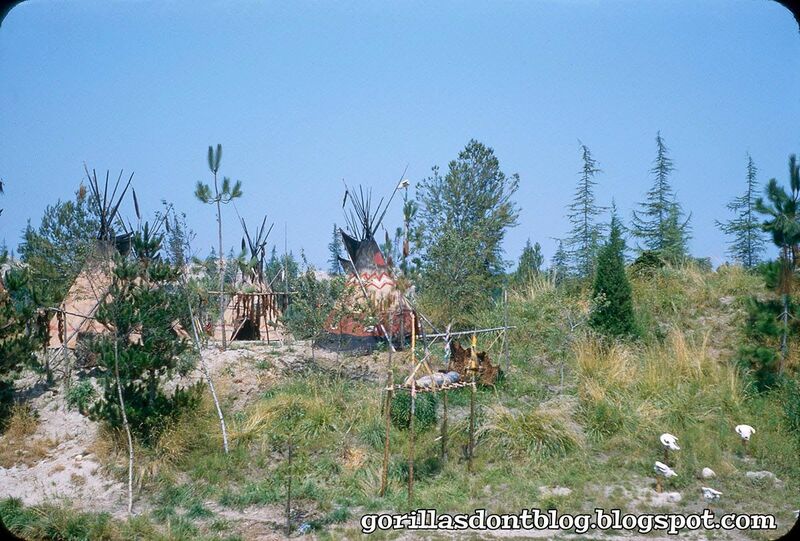 The ring of buffalo skulls with the mound in the center is also authentically Sioux. 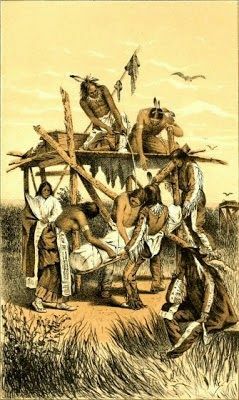 It was the site of ritual sacrifices and ceremonies in preparation for buffalo hunts. 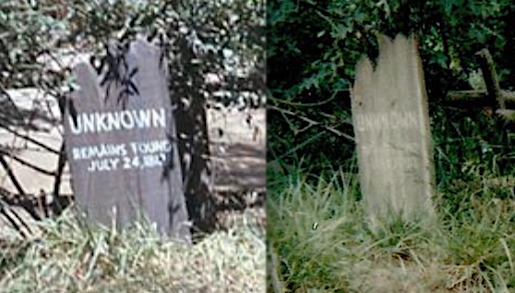 Okay, it's time now to look at the third and most obscure of the lost TSI cemeteries. 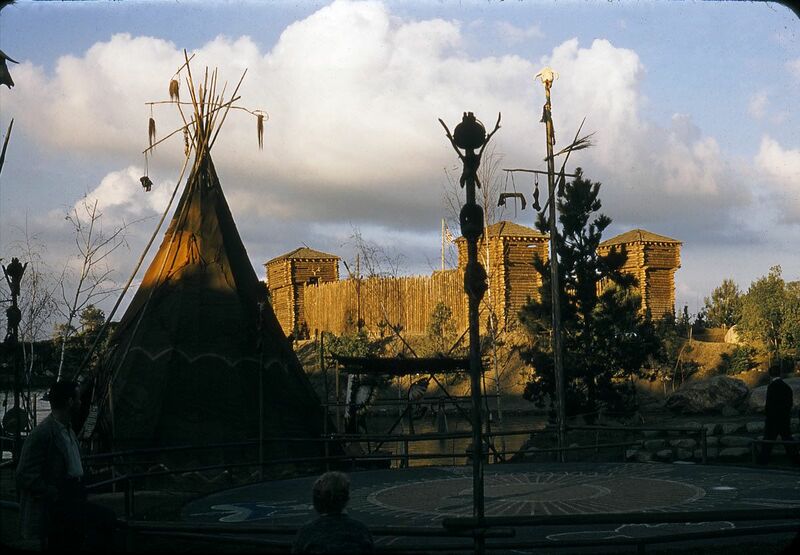 Even WDI Imagineers and seasoned DL historians were gaping at that one. Who remembered these? Amazing. Well, prepare to be amazed all over again, because these two are only HALF the story. They were in fact a second set, replacements for another pair in the same spot. The first set lasted no more than a few months before "Hintley" and "Campbell" here took their place. 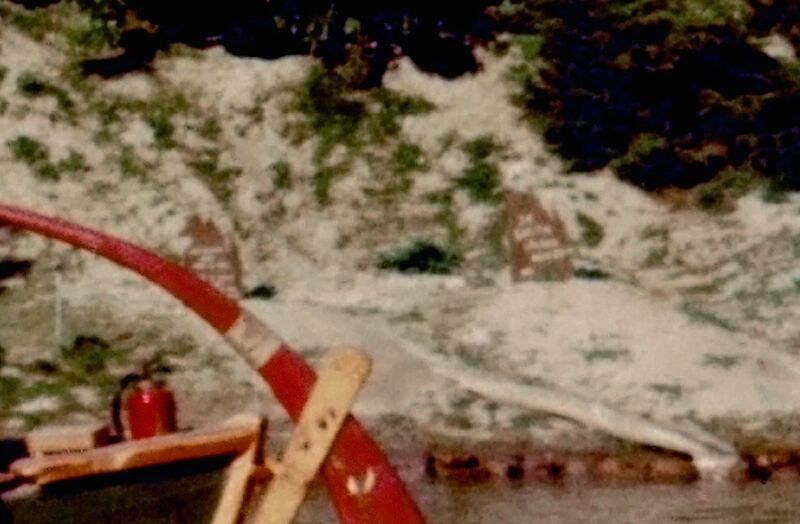 Since the graveyard behind the Fort was not original to the 1956 opening but was definitely there by the second half of 1957, I suspect that the riverfront stones came out when the Fort graveyard went in. 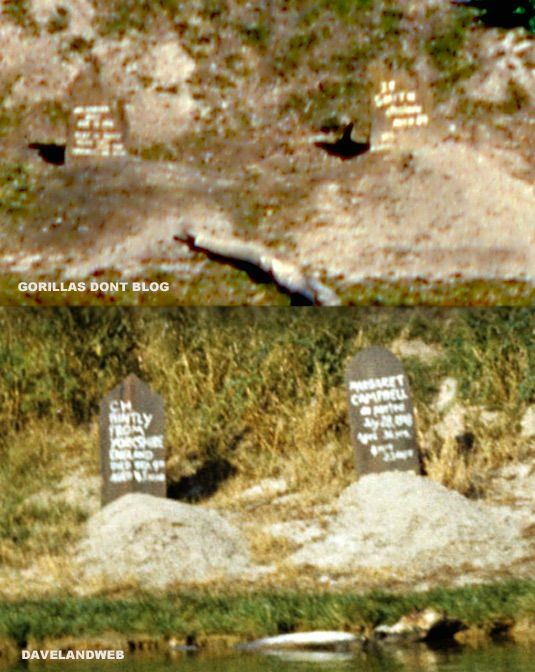 In support of this theory is the fact that one of the original riverfront stones had a similar epitaph to one of the Fort stones, and it's unlikely that both would have been on display at the same time. 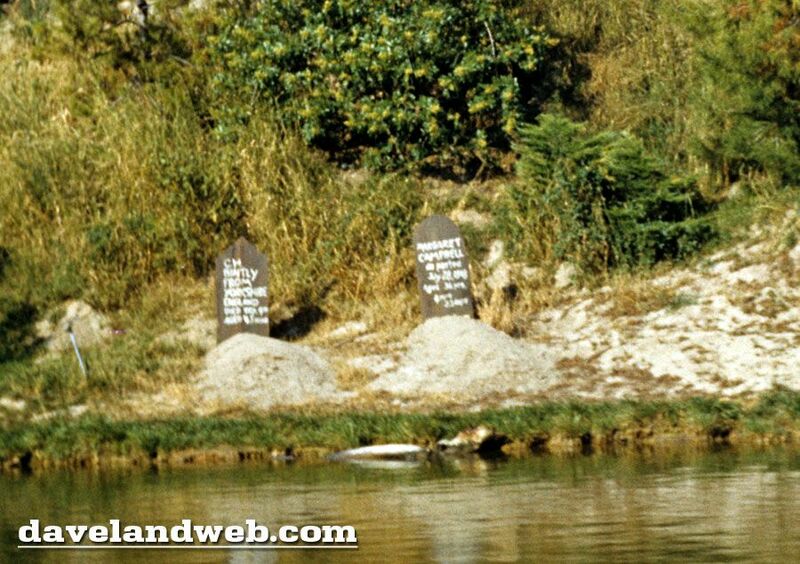 Photos of the first pair exist, but the headstones are so easily overlooked in the relevant pictures that they are practically invisible. The two best photos I've seen are both from the Major. interesting enough in their own right to justify putting them up. Now you have all the photos of the original set that I have. 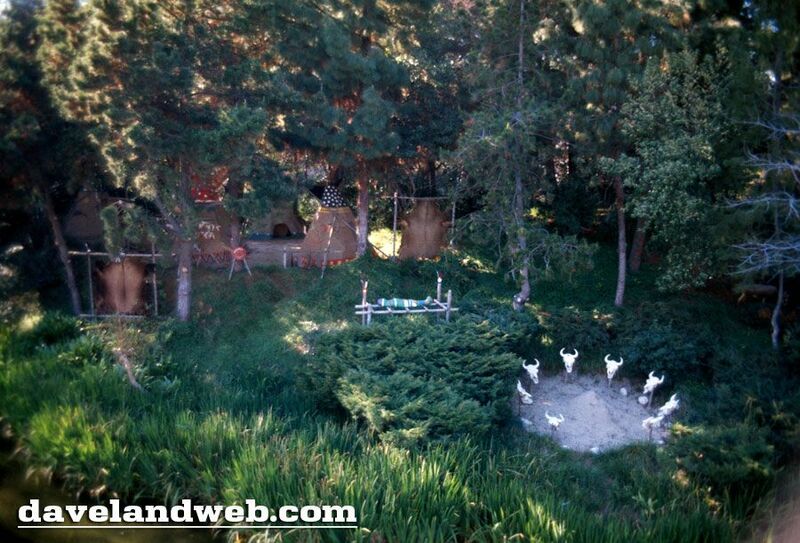 It was probably because they were so hard to notice that they were quickly replaced with a more conspicuous set. You want the texts? Well, three out of four is the best I can do. Maybe you can do better. 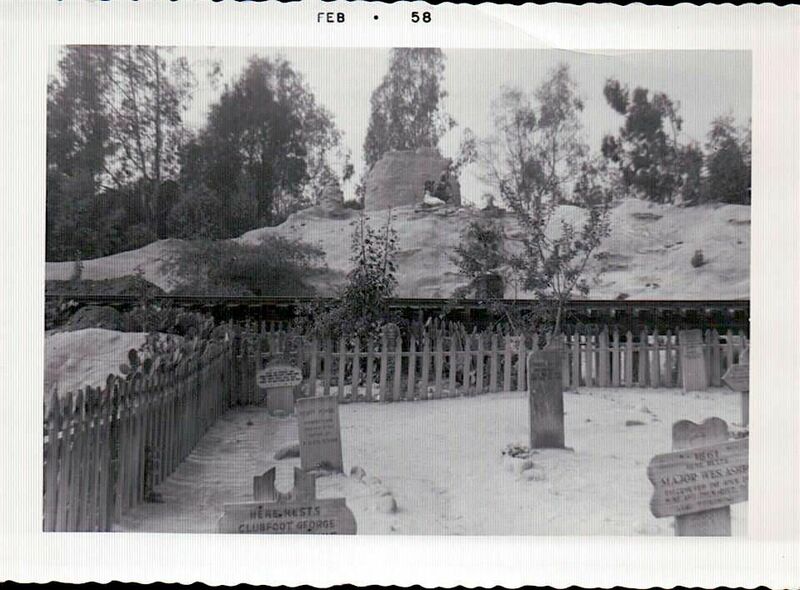 By the time a pathway was constructed for guests along that strip of the island (1957-58), the graves were gone. They were soon forgotten. Soon forgotten becomes long forgotten. And long forgotten sometimes becomes rediscovered history. Next time you pass by that side of the Fort, be sure to pay your imaginary respects to the imaginary dead, the ghosts of ghosts.